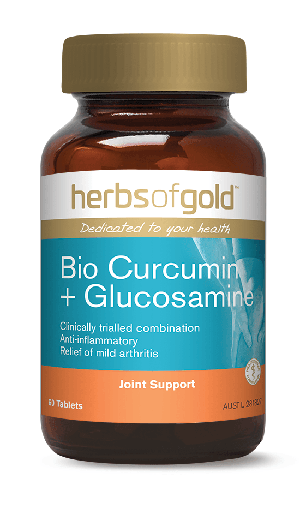 Herbs of Gold Bio Curcumin + Glucosamine is a powerful combination of two of the top-selling ingredients for the management of osteoarthritis: curcumin and glucosamine. The highly bioavailable MerivaR is used in this formulation, which is a curcmin-phospholipid complex. Curcumin, as found in its natural state in turmeric root, has very poor absorption through the human intestinal wall1, which is why black pepper has often been used- to enhance bioavailability. Recently, however, a curcumin-phospholipid complex has been designed to enhance curcumin bioavailability even more. This means that the powerful anti-inflammatory compound can absorb at a higher rate through the intestinal wall and find its way to the joints, where it is needed to help relieve inflammation and pain in osteoarthritis2. The other active ingredient found in Herbs of Gold Bio Curcumin + Glucosamine is glucosamine hydrochloride. Glucosamine has been used for decades for the management of osteoarthritis. Glucosamine is actually manufactured in the human body, and used for the synthesis of other compounds, such as chondroitin and hyaluronic acid. Glucosamine is an important building block for the synthesis of articular cartilage, which is the cartilage that covers the ends of the bones. The articular cartilage degenerates in osteoarthritis, leaving less cushion between the two bones, which can also lead to degeneration of the ends of the bones. Therefore, the combination of glucosamine, to assist with restructuring and rebuilding the articular cartilage, and curcumin to relieve pain and inflammation, are the pertect combination. 2. Belcaro G et al. Efficacy and safety of Meriva®, a curcumin-phosphatidylcholine complex, during extended administration in osteoarthritis patients. Alternative Medicine Review 2010 Vol 15;4 p.337-44. Adults and children over 12 years – Take 2 tablets daily, with food, or as directed by your healthcare practitioner. Glucosamine hydrochloride is derived from seafood. If symptoms persist consult your healthcare practitioner.